Ali Burch originally hails from Louisville, KY, but with a suitcase and a bottle of bourbon in hand has made Chicago her home. Film and television credits include An Acceptable Loss, Projection, Hot Date, Inside the Woods and Chicago P.D. 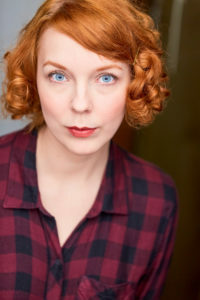 Ali’s theatre credits include 3 seasons of A Christmas Carol and Feathers and Teeth (Goodman Theatre), Southern Gothic (Windy City Playhouse), A Midsummer Night’s Dream and Tea At Five (First Folio Theatre), hamlet is dead. no gravity (Red Tape Theatre) and Monstrous Regiment (Lifeline Theatre). Regional credits include That High Lonesome Sound (Humana Festival of New American Plays), At The Vanishing Point, Blissful Orphans, Dracula and A Christmas Carol (Actors Theatre of Louisville) and Hello Out There (Savage Rose Theatre).